Regular baby wipes might cost less than pop-up wipes, but pop-up wipes allow you to pull a wipe out of the tub one-handed, and that is a very good thing. 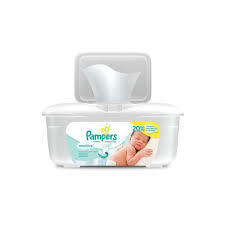 You can buy a tub of Pampers pop-up wipes at drugstores, grocery stores, pretty much everywhere, for around $3.50 for 72 wipes. Save the tubs because refill bags are cheaper.